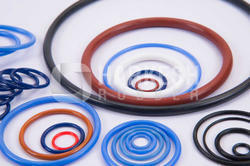 We are a leading Manufacturer of hnbr quad rings from Mumbai, India. Over the years, we have been involved in offering a wide gamut of HNBR Quad Rings. These are manufactured using technologically advanced machinery and high-grade raw material. Furthermore, these are tested on well-defined parameters at every stage of production to ensure their conformity with international quality standards. We offer these at cost effective prices. Looking for HNBR Quad Rings ?